When you are planning to implement remote desktop service, there are few terms that you must understand. Remote desktop session host is the server where we hosts the application that are required for TS clients. Users can connect to a terminal server to run programs, to save files, and to use network resources on that server. So the servers that have this feature installed will act as your remote desktop server. 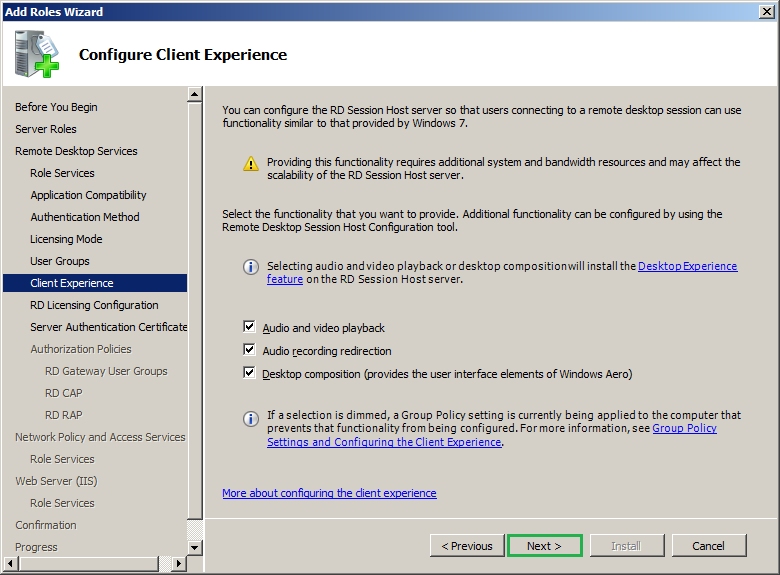 The RD licensing will manages the Remote Desktop Services client access licenses (RDS CALs) that are required for each device or user to connect to a Remote Desktop Session Host or Remote Desktop Virtualization Host server. 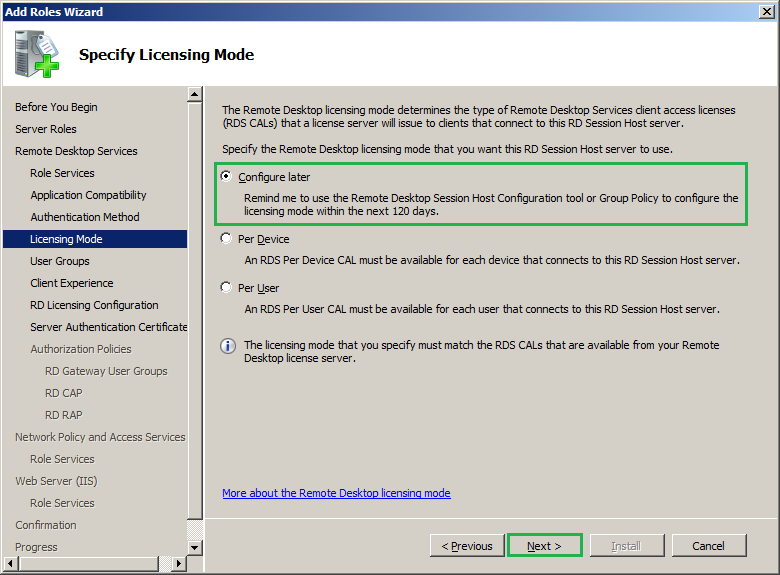 You use RD Licensing to install, issue and track the availability of RDS CALs on a Remote Desktop license server. The grace period of this service is 120 days and a permanent RDS CAL should be purchased. There are several methods to purchase the license and those are mentioned on MS article(http://technet.microsoft.com/en-us/library/cc771547.aspx). The License Server role can be installed on your Session Host server or in a dedicated server. If we install Remote Desktop Licensing role on a dedicated server any additional RD Session Hosts that we add in the future can share this service. However this roles is not required to be configured with initial stages as we have a trial license for 120 days. 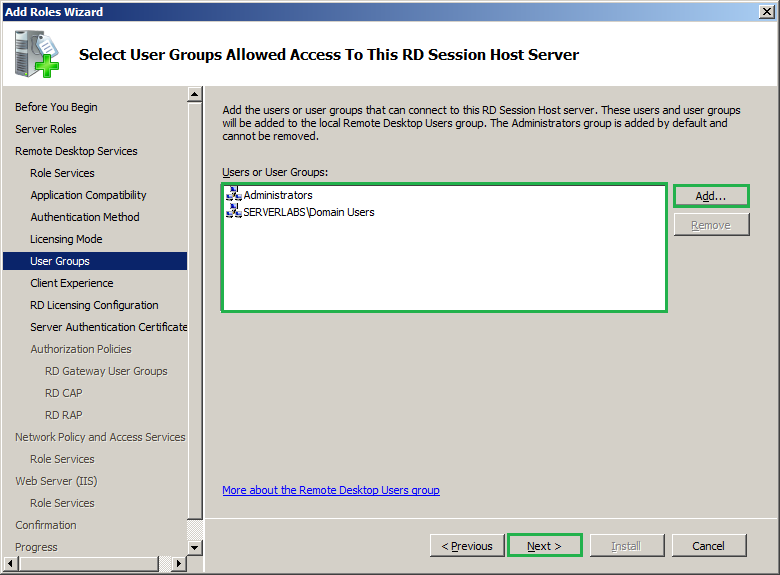 RD Web Access allows the users to get access with the applications and server desktop that are allowed to the clients. In order to achieve this, users can visit the web site that are configured by remote desktop administrators through their web browsers(IE, chrome, Firefox etc.). When the users starts a RemoteApp program, a terminal Services session is started on the terminal server that hosts the RemoteApp program. When you deploy RD Web Access, you can specify which terminal server to use as the data source to populate the list of RemoteApp programs that appears on the Web page. This role enables authorized remote users to connect to resources on an internal corporate network from any Internet-connected device that can run the Remote Desktop Connection (RDC) client. 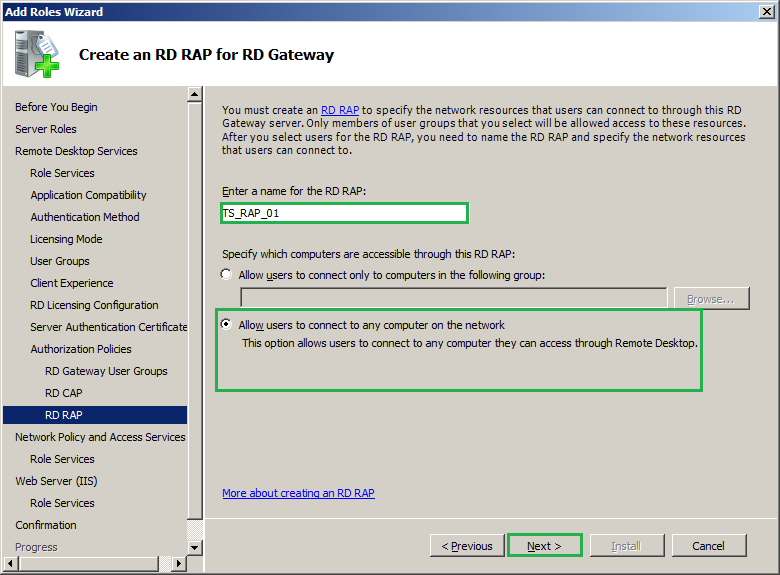 RD gateway improves the security by establishing an encrypted connection between remote users on the Internet and the internal network resources(hosted on Remote desktop server). 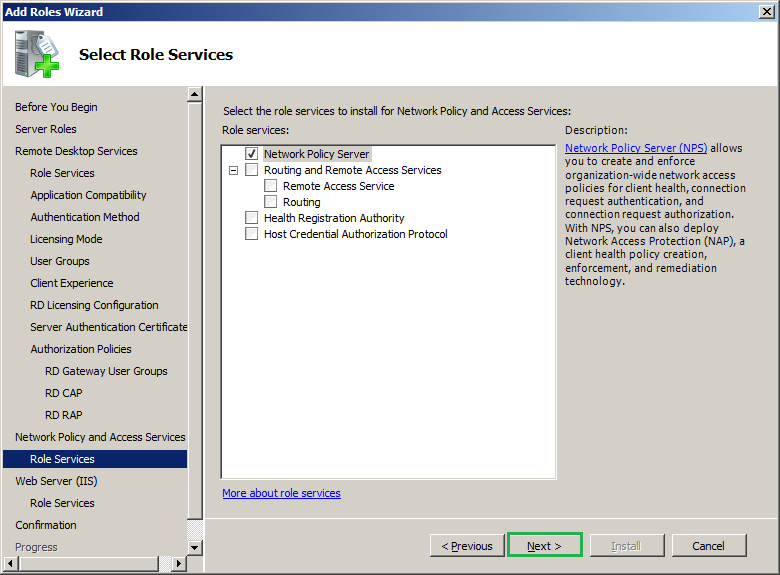 Note that, RD Gateway role service require other roles to be installed for its functionalities(Ex: Network policy and access service ,Web Server (IIS)) and those will be installed automatically during the role installation. RD Connection Broker have one of the vital role in remote desktop service. It keeps track of user sessions in a load-balanced terminal server farm. You can make use of Windows failover clustering feature to achieve this. The RD connection broker saves session state information, associated user of particular session and server where each session exists. When a user who has existing session connects back to terminal server the RD connection broker identifies it and redirects to the server where its session exists. This prevents the user from being connected to a different server in the farm and starting a new session. RD Virtualization Host integrates with Hyper-V to provide virtual machines that can be used as personal virtual desktops or virtual desktop pools. If a user is assigned and requests a personal virtual desktop, RD Connection Broker redirects the user to this virtual machine. If the virtual machine is not turned on, RD Virtualization Host turns on the virtual machine and then connects the user. In my environment I am going to install the roles Remote Desktop Licensing, Remote Desktop Gateway, RD Connection Broker, RD Web Access and Remote Desktop Session Host on the same server and I don't want the service remote Desktop Virtualization Host as I don't have Hyper V installed. Note: It is not recommended to install and configure RDS on an active directory server as it can reduce the security and decrease performance of server, however you can do it if required. It is recommended to install remote desktop session host before you install any applications that you want to make available to users. Else the application may not work as expected for clients. 1. Log on to the server where you want to install RDS as the user who has administrator and enterprise admin rights. 2. Open Server Manager, click Start-> Administrative Tools->Server Manager. 3. Under the Roles Summary heading, click Add Roles. 4. 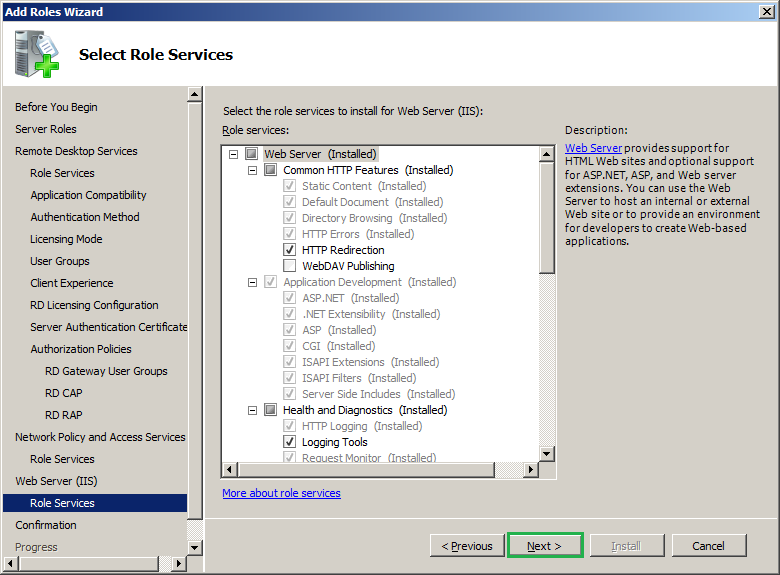 In the Add Roles Wizard, if the Before You Begin page appears, click Next. 5. 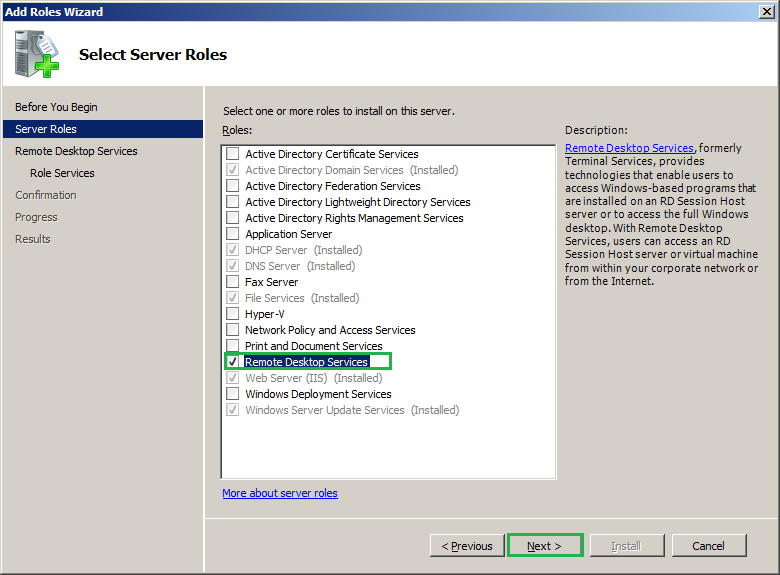 On the Select Server Roles page, select the Remote Desktop Services check box, and then click Next. 6. 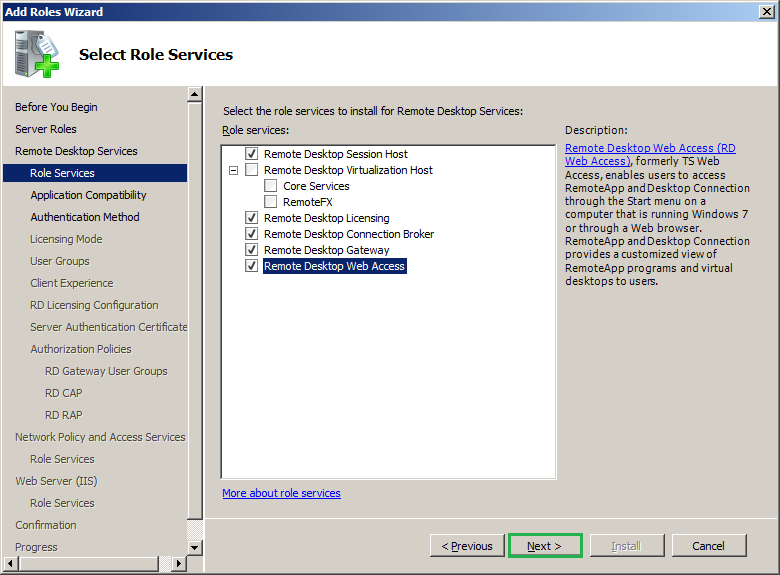 On the Remote Desktop Services page, click Next. 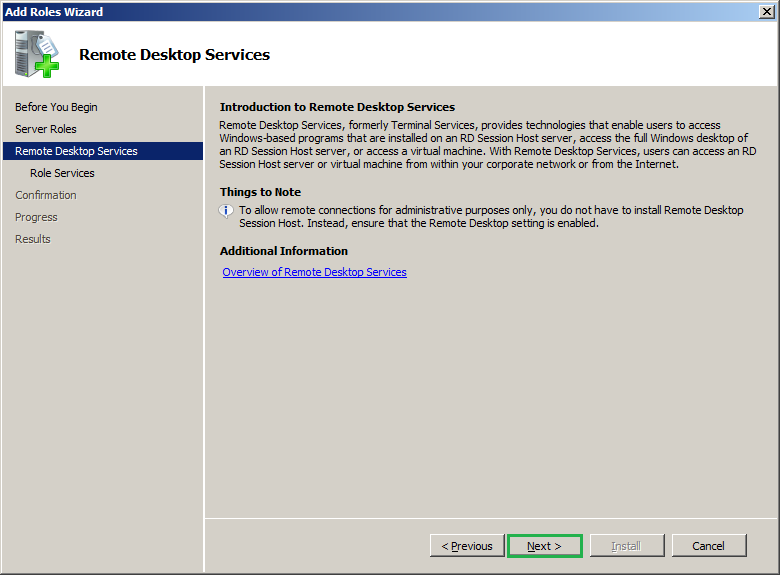 This is just a brief idea about remote desktop services. 8. 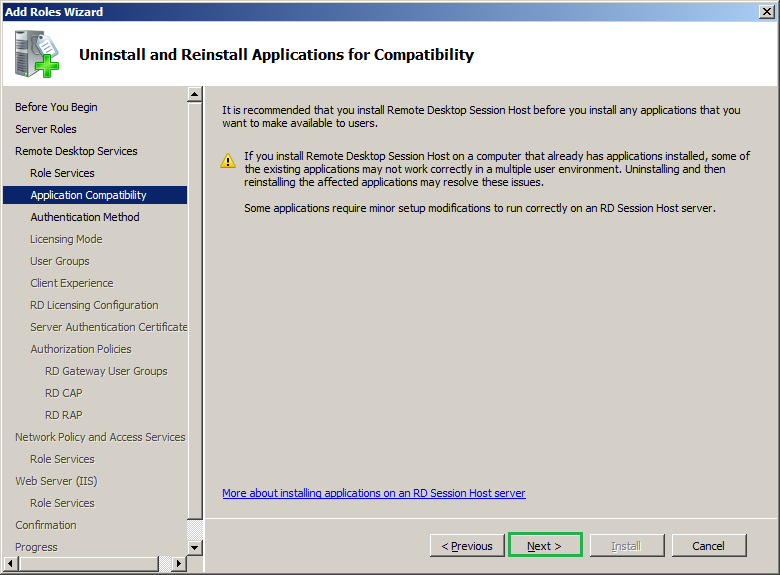 On the Uninstall and Reinstall Applications for Compatibility page, click Next. Hopes you have got the message. 10. You need to specify the licensing mode that you want to use for using RDS. It can be purchased either for per user or per computer. Else you can install the license later as we have 120 days trial period. I am selecting as trial and continue where as you can install the license now or later. 11. Select the user groups that can access the remote desktop server and its services. I am selecting all the users of my domain and you can achieve the same by clicking on Add button. If you have a specific set of users that have to access terminal server you can create a group in active directory and add the groups to this list later as well. Note: Administrator users are default in this operation and cannot be removed. 12. Now you can specify the client experience, this settings are optional and select as required. Please note that, when we enable more functionalities that can lead to high system and bandwidth usage which may affect the performance RD session host server. So reduce the feature if it is really not required. 13. Next you need to specify the discovery scope for RD licensing. It is used by RD session host servers to automatically identify and discover the licensing server. 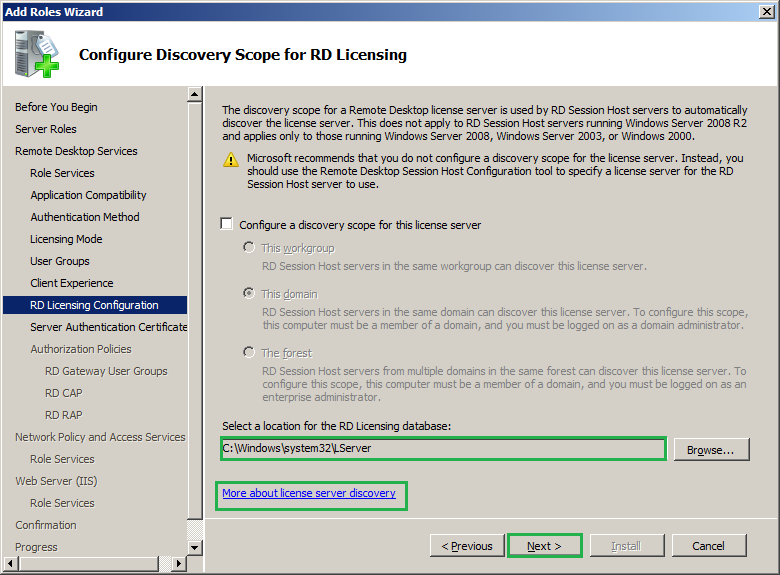 Leave the selection as default and you can the RD licensing database location if required. It would be really worth if you can click on the link More about licensing directory to get much better experience on this. 14. You must have a certificate for SSL communication. It is recommended to get the certificate from a trusted certificate authority(CA) especially when you have to access the RD session from outside network. In my case I have one self signed certificate installed on my server and it is list automatically here. If you do not have any certificate installed on server it will not list and you can import that now by clicking Import button. If you want to create a SSL certificate now, you must select the second option create a self-signed certificate for SSL encryption or you can select the third option choose a certificate for SSL encryption. 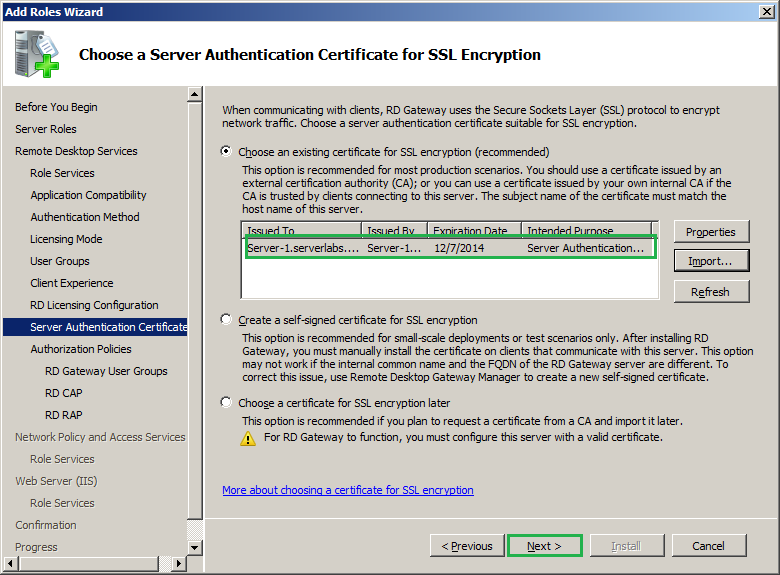 Make sure that the SSL certificate is attached to HTTPS binding on your IIS. 15. 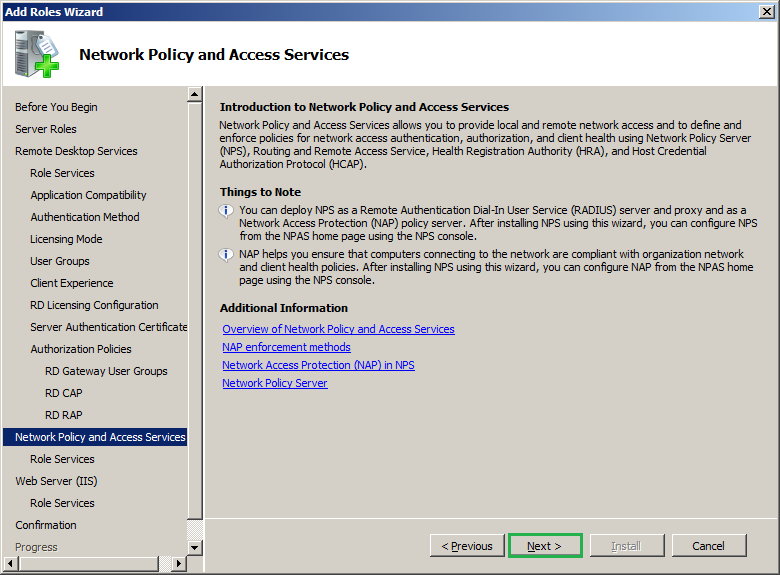 Now on you need to specify the authorization policies that will control the RD session host clients with the way it is allowed to connect. 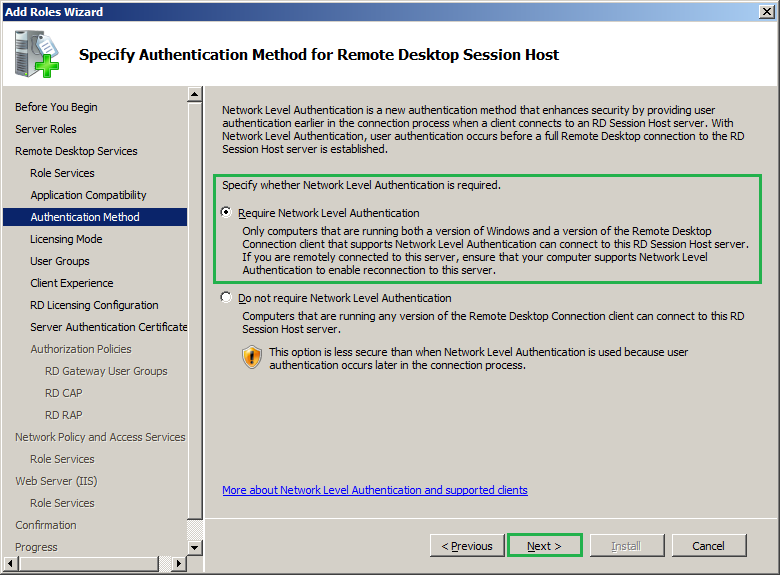 There are two important terms to understand in this concept, that are Remote desktop connection authorization policy(RD CAP) and Remote desktop resource authorization policy(RD RAP). 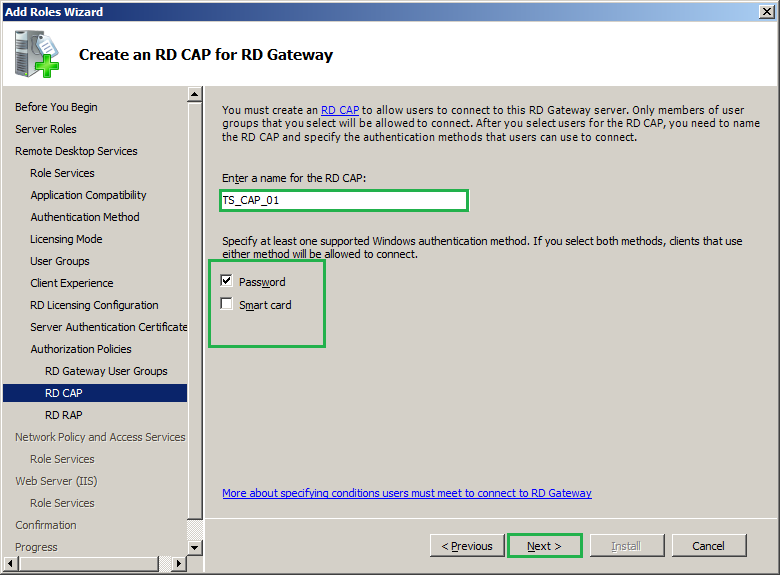 In simple words, RD CAP describes the users that can connect to this RD gateway server and RD RAP allows us to specify which terminal server is allowed for users to connect from network. Until we configure RD RAP and RD CAP users will not be able to connect to RD server, so I will configure this policies now. Select Now under create authorization policies and click Next. 16. Under User group membership (required), click Add button, and then specify a user group whose members can connect to the TS Gateway server. You must specify at least one user group and I have allowed it for all my domain users. In this session you might be little confused as we have already configured the user groups that can access the RD server at step 11. 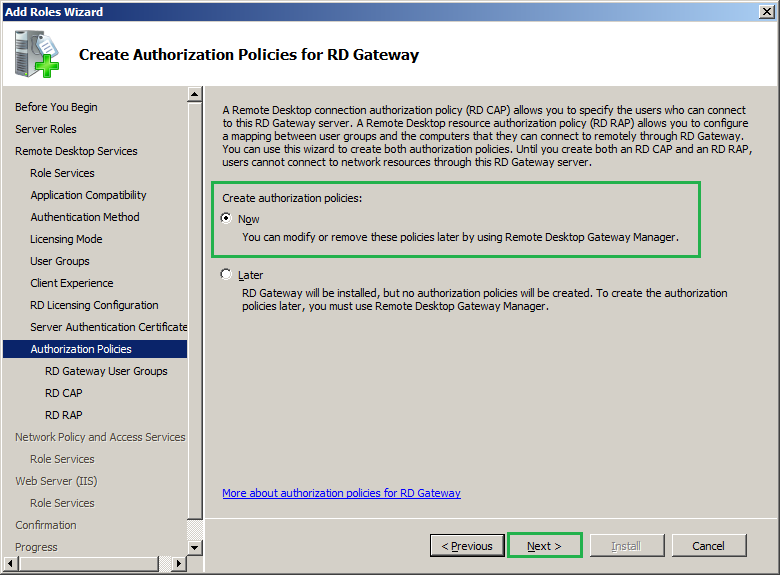 All you want to understand is, step 11 is defined for RD session host server and as you know RD gateway is an additional security feature for RD server here you are specifying the users that are allowed to connect through RD gateway. Hence the same user group is mentioned here as well, Click Next to continue. 18. Here you want to specify the details for RD RAP. The RD RAP can be either the default or customized one as per your choice. Here you must specify the network resources that the RD users can connect through, When a RD user connects and we need to set him the limitation of accessing the computers you can specify this settings here. 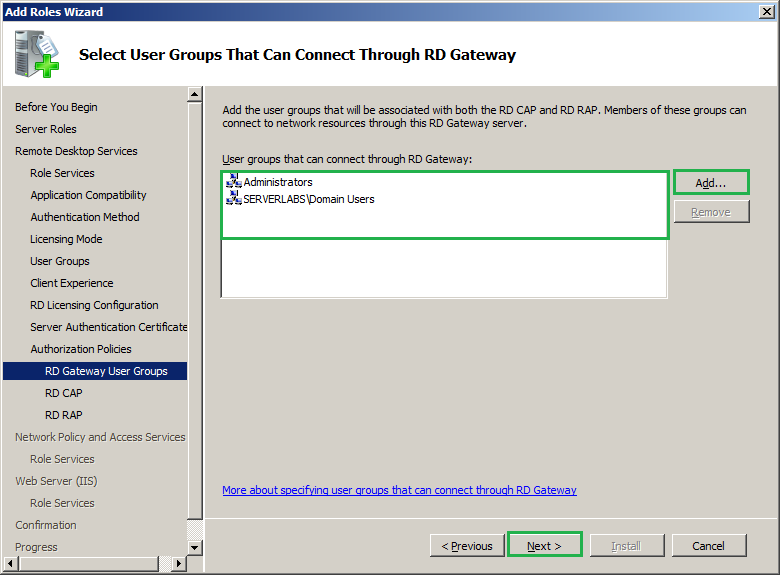 For example, When the user 'Livin' connects through RD gateway and he needs to access only a group of computers, you can select the second option Allow user to connect only to computers in the following groups and set the group. 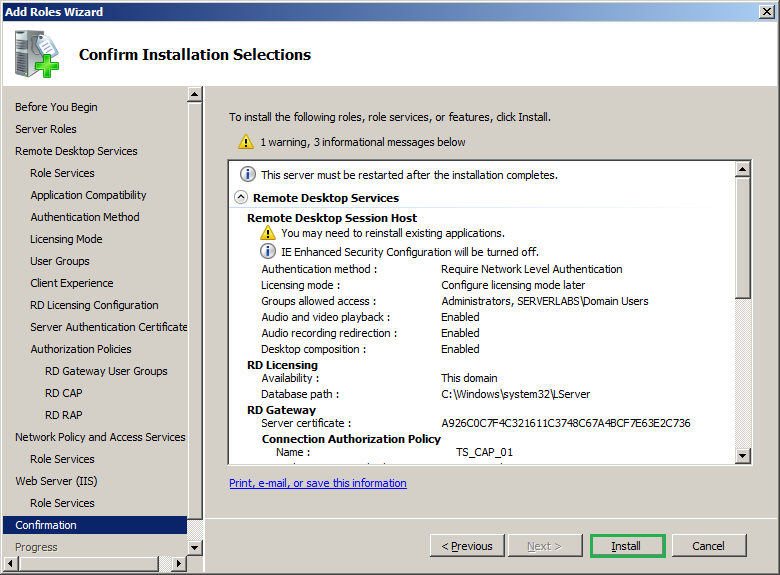 In my scenario I have allowed all of my domain users to use RD service and I am not settings the limitation for this so selecting Allow users to connect to any computer on the network. Define the settings as required for you and click Next. 19. As discussed above, for RD gateway to function properly we need to have certain features to be installed. 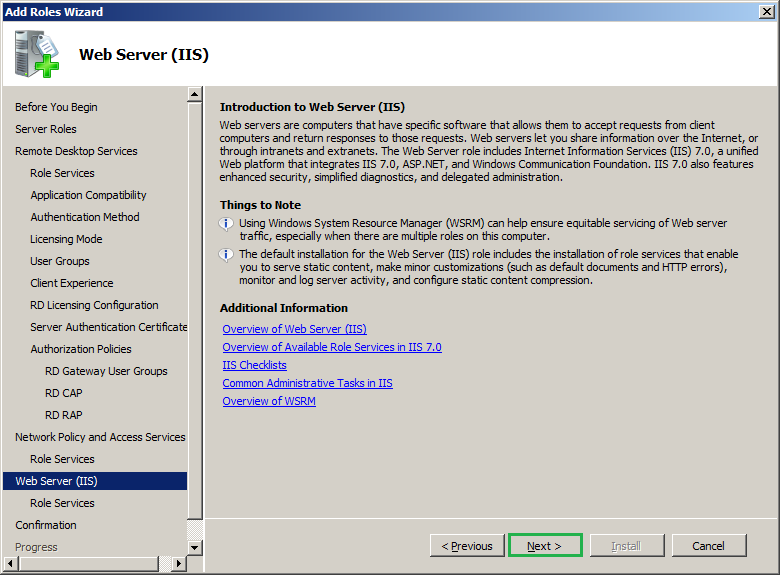 That are Network policy and access service ,Web Server (IIS). Now you will have the introduction and confirmation to install these features, simply click Next to get it done. 20. Now we will have the summary of the configurations that we done so far. Review those and click install to start the installation. 21. 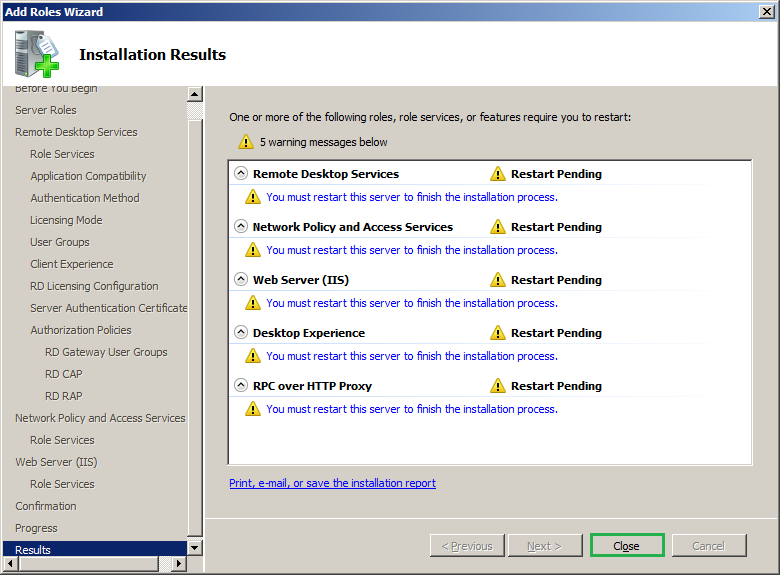 Once the installation is completed you can close the window and you must restart the server to complete this operation. 22. Once the server is rebooted, you must login and the installation will continue which will end up in below window, Click Close. 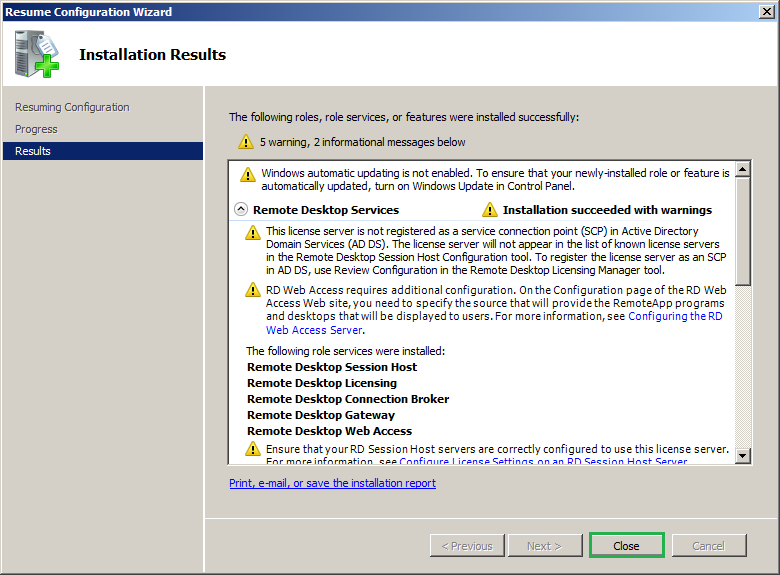 This completes the installation and basic configuration of Remote desktop server. The advanced level of configuration can be viewed on this link.